A Certificate of Deposit (CD) from 1st Ed Credit Union offers an excellent way to earn more on your deposits for a set time. CDs are also turnkey and easy to open – simply agree to keep a specific amount on deposit for a set term. When it comes to investing, you can choose from a number of flexible CD options. Early withdrawals are subject to penalty. Earnings (dividends) may be withdrawn or transferred into another account without penalty. Enjoy the guaranteed earnings of a CD at 1st Ed. Accounts are subject to Regulation D. Learn more here. 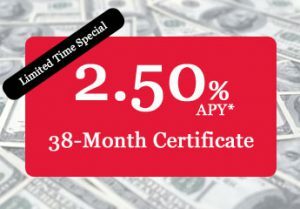 Your savings are federally insured to at least $250,000 and backed by the full faith and credit of the United States Government by National Credit Union Administration (NCUA), a U.S. Government Agency.